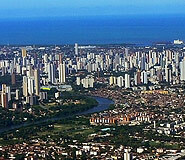 Discover Recife during your price guaranteed Brazil vacation. All of our Brazil tours have daily departures and are fully customizable. 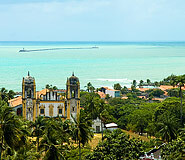 The complex and multicultural history of both Recife and Olinda have made it the culturally rich region it is today, and much of the historically significant sites have been lovingly refurbished, restoring to them the value they deserve. Recife Antiguo, or Old Recife, is the site of the city’s initial 16th century Portuguese settlement, and beautifully renovated buildings and churches make this area a pleasure to visit. 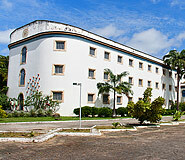 Similarly, neighboring Olinda’s historical center was granted UNESCO World Heritage Site status in 1982. Literally meaning “Oh, beautiful!” in Portuguese, this cobblestone-street city is considered to be the best preserved in all of Brazil. Aside from its innumerable churches, colonial mansions, and public buildings, Olinda is also a thriving cultural center. One of the most vibrant and popular Carnivals is held here yearly, and distinguishes itself from the rest by remaining free of charge to revelers. During this celebration the addictive rhythms of frevo, maracatu, and others fill the streets. Blessed with a duality found in a surprising number of Brazil travel destinations, Recife can claim not only historical and cultural appeal, but also simply spectacular beaches. Recife’s Boa Viagem beach is one of Brazil’s most famous urban beaches. The sparkling white sand and inviting green waters enchant thousands of visitors a year, and the city’s comprehensive infrastructure of hotels, restaurants, and services make it a comfortable holiday destination for foreigners and nationals alike. But variety is the spice of life, and thankfully the entire coastline of Pernambuco is lined with beaches for all tastes. Maria Farinha, for instance, is a water-sport lover’s dream, and Porto de Galinhas has been hailed by numerous travel magazines as the one of the best beaches in all of Brazil. The crystal clear, warm waters of this “Port of Chickens” – just 60 km south of Recife – invite visitors to bathe for hours or snorkel among the many coral reefs. The name refers to the bay’s slave trading past. Clandestine trading continued here after it was officially abolished, and slave masters in Recife knew to expect a load of arrivals when they heard that a load of “chickens” had arrived, a term used to avoid mentioning by name the now prohibited activity. Every day in Recife is the best day. It is precisely because of its gorgeous year round climate that it stands as one of the most popular beach resort areas in all of Brazil. Temperatures stay steady no matter what time of the year, ranging from 77°F to 90°F (25°C to 33°C) in both summer and winter. It never gets too hot because of the fair winds from the Atlantic Ocean, and never too cold because of Recife’s proximity to the equator. The rainy season lasts from April to about July, but even the rains are hardly ever pronounced or last long enough to make an impact on a Brazil holiday. We are back in Malta! We would like to thank you and your team for a most enjoyable vacation. Considering the many countries (Peru, Chile, Argentina, and Brazil) we visited, and the 14 flights we took, all went well. Once again, thank you for a great vacation and I will certainly recommend Brazil For Less to those who would like a stress free holiday in South America. This luxurious hotel is located in the best part of Boa Viagem Beach, right in front of a natural swimming pool. The bold architecture, blue windows, and 241 rooms all dotted with beach views make Atlante Plaza the ideal place to stay in Recife. At Atlante Plaza there are comfortable rooms with granite floors, and equipped with telephone, wireless internet, air-conditioning, cable, safe, and mini bar. See the city from the hotel’s most beautiful spot, the roof, or enjoy the swimming pool, gym, sauna, game room, 24 hour babysitter service, and beauty parlor. The hotel’s friendly staff and attentive service make all the difference. You can even pick from a pillow menu with various aromas and stuffings, such as lavender, rosemary, and chamomile. Just a stone’s throw away from Boa Viagem beach, and the Recife City Center, the Best Western Manibu Recife Hotel is divided between two blocks. The blue wing and the green wing comprise an excellent hotel complete with convention center, wireless internet, gym, restaurant, 24 hour room service, valet parking, dry and steam saunas, solarium, 2 bars, gift shop, and art gallery with paintings of the region. The onsite Pedra Bonita restaurant has buffet menus or a la carte options and excellent service. The comfortable rooms are all decorated in a classic style and fully equipped with air conditioning, cable TV, mini bar, hair dryer, telephone, and more.